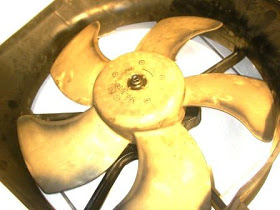 Radiator fan and air conditioner condenser fan motor noisy motor can be repaired by lubricating shaft of the motor. Lubrication can be done from the outside without opening the motor housing. But the fan needs to be removed to get access to the shaft. The cost of this repair is quite cheap if compared with the price of a new motor that can reach hundreds dollar. Once repaired then the motor shaft will rotate more smoothly. If the motor is connected to the battery and measured with a digital ampere meter then it is obvious that the consumed current becomes lower. Because the motor will generate electricity if the shaft is rotated by hand, when measured by a digital volt meter then the produced voltage is higher after repair. Read also the fan motor generating electricity powered by wind turbine. The procedure is quite easy and can be done at your garage. On some vehicles, it needs to open radiator hose to pull out the frame of the fan motor. Sometime it needs to remove the front grille, to get access to remove the air conditioner fan. If the radiator hose must be removed, a new radiator coolant will be needed. Do not reuse the used radiator coolant, although it looks clean. Because of it's chemical properties may have changed because contaminated by dirt. Contaminated coolant is acidic (corrosive), radiator will be corroded. If the radiator coolant is not available, it can be replaced with clean water. And later coolant can be added into the radiator. 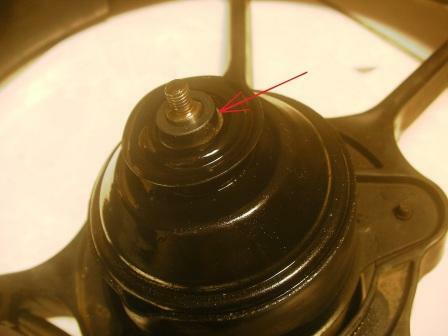 After the fan frame removed from the vehicle, it can be seen a nut that holds the fan on the motor shaft, as the following photos. Loosen and remove the nut. Remove the fan of motor shaft. In some types of motor, there is a spacer ring on the motor shaft. 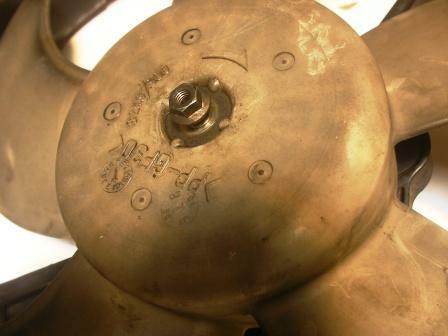 That spacer ring can be seen after the fan removed, as pointed by the red arrow in the photo below. The ring can be easily removed by hand. 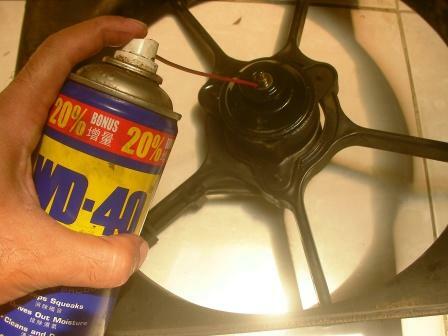 Spray lubricant such as WD-40 on the base of the motor shaft. Rotate the shaft by hand. The shaft may also be rotated by supplying electric current to the motor. Be cautious that the sprayed lubricant can be scattered everywhere when the motor shaft rotates. Make sure motor position is facing up so that the lubricant can penetrate down into the bearing. See photos below. After the WD-40 seeps into bearing, then continue to apply lubrication oil to the motor shaft. 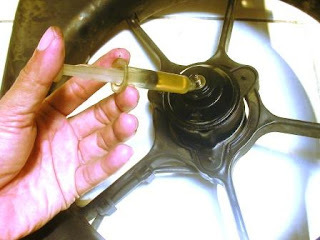 I use a 20W-50 engine oil, which is applied by a syringe pump. See the photo below. Rotate the shaft by hand, or by applying electric current to motor. Do it repeatedly until the sound of the motor become smoother, not noisy. WD-40 lubricant is more dilute than oil so it seeps easily into bearing gap. If the oil is difficult to seep in, then spray again WD-40. That's why WD-40 lubricant is sprayed first in order to make the way for oil to seep. The above procedure can also be applied to the air conditioner fan motor (pancake motor), as the following video. At the beginning of the video, there is a rough noise from the motor, it sounds krkrkrkr when the motor rotates. The noise will sound louder if the fan and frame are fitted to the motor. Because the fan is made of plastic plate, and the frame is made of a metal plate. Both plates will be vibrating (resonance) so that motor noise will be much louder. No need to open the motor housing. Because usually it will be difficult to put it back properly after the housing has been opened.